Police say they've arrested a man in a parking lot at Gillette Stadium and seized swords, a meat cleaver and an electric stun gun. -- Police say they've arrested a man in a parking lot at Gillette Stadium and seized swords, a meat cleaver and an electric stun gun. 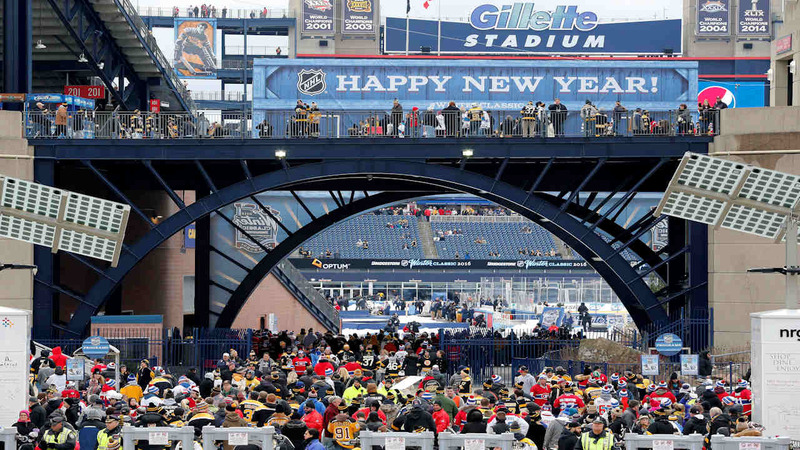 WCVB-TV reports Foxborough police say officials at the NHL's annual Winter Classic game on Friday at Gillette Stadium received a report of a suspicious man at an off-site employee parking lot. Police say they seized the weapons from a car, but there was no threat to the stadium or the event. Police arrested 48-year-old Matthew Bromson, of North Granby, Connecticut. Bromson faces charges of trespassing, disorderly conduct, possession of an electric stun gun and three counts of assault with a dangerous weapon. It's unclear if Bromson is represented by a lawyer. A phone listing for Bromson rang unanswered Saturday. He's expected to be arraigned Monday.